Lab501 shot some photographs of the Antec High Current Pro Platinum 1000W power supply at CeBIT. 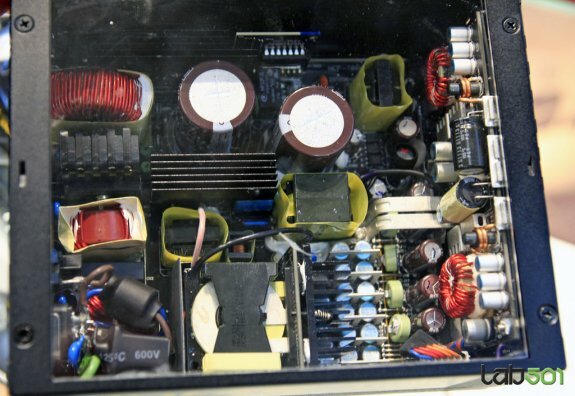 The company had a special model with acrylic windows on display, so visitors could see the interior of the power supply. The unit is made by Delta Electronics and features a quad-rail 12V design with a max of 40A on each rail. Antec's exhibit featured a special body retrofitted with acrylic windows so visitors could see its innards, the retail version will obviously have a full-metal body, and a 135 mm fan in its right place, to keep the unit cool. The HCP Platinum 1000W features a quad-12V rail design, with four 40A rails. The unit features completely modular cabling, including for the 24-pin ATX and dual 8-pin EPS connectors. There's sufficient cabling for even 4-way setups.